Reflection is so important for continued learning and growth. I developed the list below as a tool for educators to reflect on practices that help prepare students for a rapidly changing, complex world. Some of these practices are new. Some are not. Some of them involve technology. Some do not. 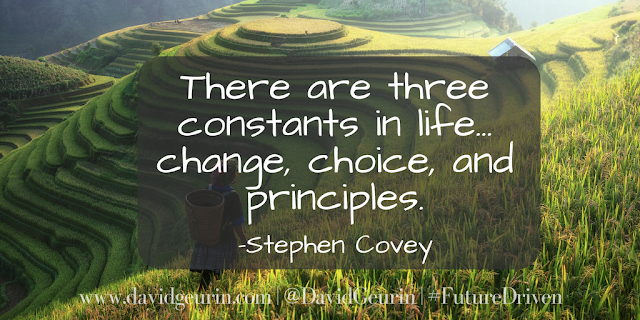 These are all based on important themes from my book, Future Driven. These factors help prepare students for a modern world where continuous learning and adaptability are paramount. I don't think I would expect any educator to be pursuing all of these indicators at once. And this list should never be used to think in terms of judging a good teacher vs. a bad teacher. So don't look at it like that. The purpose of the list is for reflection and growth. It might give you an idea of where you want to focus your learning for next school year. You could pick one or two and consider how you might develop the practice in your classroom. It might help you consider your next steps in your growth as an educator. 1. I provide opportunities for project-based and inquiry-based learning. 2. I give students choices about learning (time, place, path, or pace). 3. I am learning new things about technology and sharing my learning with students and teachers. 4. My students have opportunities to connect with real-world experts. 5. My classroom learning space provides flexibility for student-centered grouping and learning tasks. 6. My students regularly have opportunities to use digital tools to leverage their skills for learning tasks. 7. I utilize Genius Hour or 20 percent time to provide opportunities for students to pursue their passions and interests. 8. I model risk-taking, grit, and perseverance for students and regularly discuss the importance of these characteristics in class. 9. I build strong relationships by greeting students, calling them by name, and getting to know them as individuals. 10. My students assume considerable responsibility for class discussions. 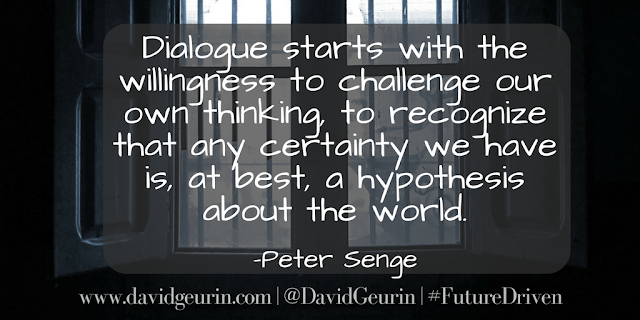 Conversations become student-led, instead of teacher-directed. 11. My students take on projects that make a difference in the community or in the world (service-learning). 12. My students have many opportunities to create work that will be visible to authentic audiences. 13. I am intentional about cultivating curiosity in my students by having them develop their own questions, by allowing exploration, or by creating mystery or intrigue. 14. I ask my students for feedback on my teaching and the relevance of my lessons. 15. Empathy is just as important as responsibility in my classroom. 16. I am focused more on what a child can do and not what he/she cannot do. 17. 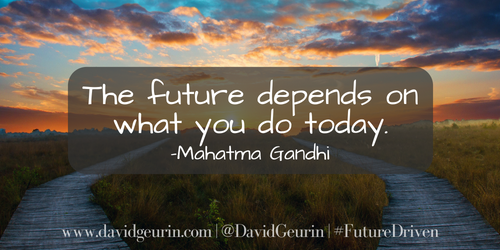 I think about how the future will be different for my students and strive to teach with that in mind. 18. My students have opportunities to experiment with different approaches, rather than just practicing a predetermined method. 19. Character is more important than compliance in my classroom. 20. My students have many chances to take initiative, not just follow directions. 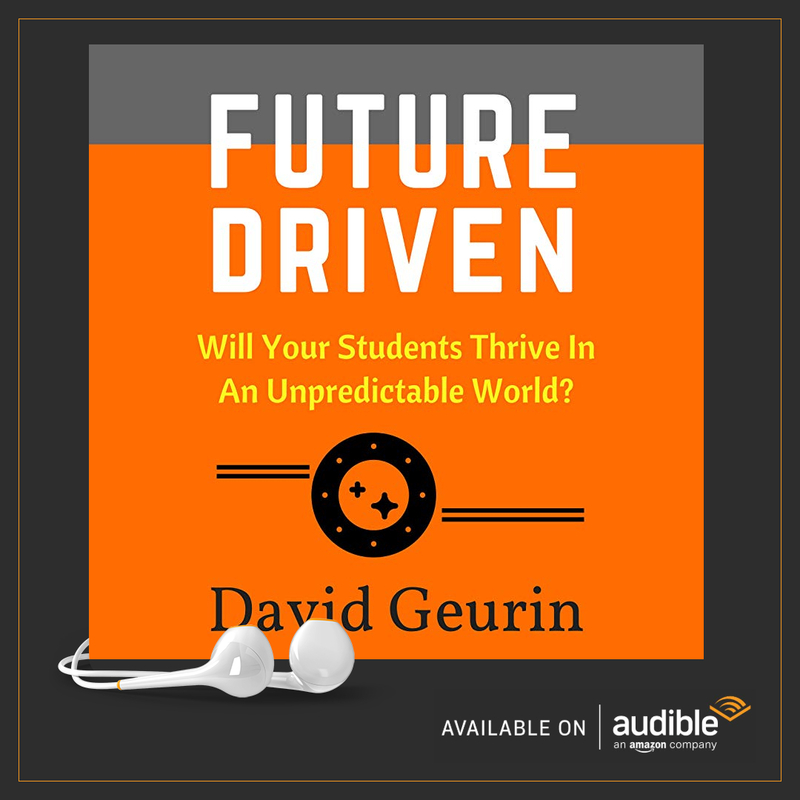 What other practices do you think are important for relevant, future ready learning? I want to hear from you. Leave a comment below or respond on Facebook or Twitter. Is Positivity an Excuse for Silencing Opposing Viewpoints? A positive school is built on positive moments. It doesn't just happen by accident. Every interaction counts. It takes a concerted effort on the part of everyone to create an environment that is awesome. So what are some things everyone should know to be more positive in their own mindset and help contribute to that positive environment we all want? How could someone not be in favor of having a positive outlook? I was curious and a little puzzled by some of the responses I've seen to the idea of having a positive attitude. I wanted to know more. So here are some of the arguments I've seen. Keep in mind I'm doing my best to synthesize, so if you're in the anti-positive thinking camp, let me know if I'm missing the point. 1. Calls for a positive attitude are one way the dominant culture silences critics and those with opposing viewpoints. By asking me to have a positive attitude, you are refusing to acknowledge my experience and my suffering. I'm not allowed to speak my mind or share my experience without being labeled a negative person. 2. Positive thinking is not the solution to mental health issues. To the contrary, it's part of the mental health crisis. It's no longer okay to feel negative emotions like sadness, fear, isolation, hopelessness, or anger. If you feel those emotions, you're not being positive, and that's not okay. The pressure to feel positive all the time is too much, and so when I don't, I feel further devalued and unable to measure up. 3. Sharing positive thoughts is empty of meaning. It's not doing the real work of challenging injustice or working to understand those who are oppressed or those who are suffering. Instead of sharing something "positive," share something that demands justice or calls out oppressive forces. In other words, raise some hell to demand change. That's doing something positive. I think those are some really good reasons to push back against positive thinking, if you define and understand being positive in a certain way. I think there are some nuances to the idea of being positive that are important for the idea to work, otherwise it's just a thought that we should all be happy all the time, and that's just not helpful. Here's how I would respond to the three concerns about positive thinking. 1. Being positive doesn't mean everyone has to be agreeable and have the same opinions. But it does mean we express our opinions in ways that are productive and helpful. In a school, leaders need to encourage productive conflict and invite critical dialogue. I want people around me to push my thinking and challenge my ideas. That's how we get better. But I'm guessing...in some cases, leaders are silencing voices who are simply expressing a different viewpoint and using positive attitude as the reason. Either you agree with me or you obviously don't have a positive attitude? It's one or the other. That type of thinking is not effective. 2. Being positive doesn't mean you're happy all the time. I think believing you should be happy all the time does result in complications to mental health. We need to feel all our feelings, the positive and negative ones. The truth is none of our feeling are truly negative. They're not bad. They're just feelings. They come and go. And as humans, all of them are legitimate. Being positive is the ability to experience the array of human emotions and respond to them in ways that are helpful. In response to every emotion, we have the choice in what we do with it. How do we hold that emotion in our mind and how do we think about it? Do we listen to what our emotions tell us and let them take us down whatever path they choose? Or, do we choose the path for our emotions? Do we point them in a direction we want them to go? We're not repressing them or denying them. It's important to fully acknowledge how we feel, but then choose to use that emotion as fuel to go in some positive direction in life. I'm going to use this pain or sorrow for good in this certain way. Of course, this is always a process. There are times I do not handle my emotions in productive ways. And that results in strain on my relationships or sticky situations as a leader. I've often had to apologize for times I allowed my emotions to choose the path. 3. Sharing positive thoughts are empty of meaning if they are empty of meaning. But they don't have to be. In fact, the person who can communicate difficult, hard truths in a positive way is a wise person. There is wisdom and strength in communicating a difficult message in a way that doesn't offend or alienate. That's making an effort to have dialogue and not a shouting match. I see no benefit to a shouting match. Neither side is really listening. Nothing productive is resulting from this exchange. And yet, that is how most people seem to be handling conversations these days in regard to our most pressing issues. It's evident all over social media. There is no dialogue. There is no civility. Each side hurls insults, snide remarks, insulting labels, and believes they have the moral high ground. Our way is the right way!!! It makes me sad when I see educators fall into this same type of behavior. Unfortunately, I've noticed more destructive posts like this recently from educators. We have an obligation to set a good example for our students every day in our classrooms, and also on social media. We have an obligation to do our very best, all the time, to be respectful and positive with our words and actions. At the same time, it's never okay to silence an opposing viewpoint on the grounds that the person needs to be positive. It's okay to ask someone to communicate respectfully. But it's not okay to silence someone who disagrees. Let me know your thoughts on all of this. Leave a comment below or respond on Facebook or Twitter. I always enjoy hearing from you. Most of what is learned in the traditional approach to school is not adaptable learning. It is discrete learning. It's focused on a specific body of knowledge and isn't always transferable to new situations. Yesterday's learning is in silos with distinct separation among the disciplines. It's the type of learning that was useful in a world where you could train for a profession and be assured of relative stability in that profession for many years. Our world is moving extremely fast. We can't even fathom how fast things are changing. We're too close to the change to get a sense of the magnitude. How can we deal with this increased complexity and uncertainty? Change is accelerating. And that creates a need for a different type of learning. 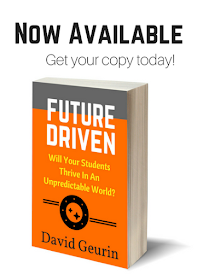 In Future Driven, I write that adaptable learners will own the future. So what makes an adaptable learner? Here are 11 characteristics. Adaptable learners are ready. They embrace change. It's not just small changes we're talking about. It's a tidal wave of change that's coming. Change is accelerating exponentially. You must be willing to adapt. You can't adjust to the changes, meet the challenges, or take advantage of the opportunities without stepping out of your comfort zone. It's not helpful to blame poor outcomes on changing circumstances. The adaptable learner looks inward first to find solutions. There's a stubbornness to find a way or make a way. No one person can have all the skills needed to meet the challenges of rapid change. But together, it's possible to leverage our shared abilities for the good of our team. In an uncertain learning environment, there will be mistakes. It's important to learn from these mistakes and press on. It's critical to stay with difficult problems and try different solutions. I believe adaptable learners are caring learners. People find better solutions when there is a larger purpose. When people are caring learners, it makes the learning meaningful. No one has it all figured out. Have strong opinions loosely held. If presented with new evidence, be willing to take a new position. Our methods and practices must change with the times, but our process of adapting can continue. And ultimately, the mission can continue. Adaptable learners are constantly picking up new skills and adjusting previous skills. There has to be a willingness to do something new even if it's hard at first. Feedback is a necessary ingredient to learning. Don't feel threatened by feedback. Pursue feedback. And use it to adapt and learn. Most people are frightened by the thought of rapid change. But the adaptable learner feels a sense of confidence. When you believe in your ability to learn and solve problems, you view challenges as opportunities. How are these characteristics being developed in your classroom or school? Are your students ready? Will they thrive in an unpredictable world? Leave a comment below or respond on Facebook or Twitter. I want to hear from you. Be Firm in Your Principles. Be Flexible in Your Practices. I'm a big advocate of positive and productive change. If one thing is certain, it's change. There will be change, and we must adapt. Our students must adapt. Our schools must adapt. The world is becoming more complex and uncertain, and that makes change even more imperative. But some things never change. Teaching principles, for instance, stand the test of time. Principles are fundamental truths. They are universal and unchanging at their core. These things should be the foundation of who we are and what we do as educators. -Treat every child, every person, with dignity and respect. -Make kindness a top concern. 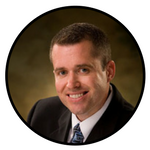 -Communicate clear goals and objectives. -Believe the best of your students. -Provide extraordinary learning experiences, not just lessons. -Make learning relevant to time, place, and the individual. -Persevere, push through obstacles, and never give up on a child. -Consistently provide useful and meaningful feedback. These things will not change. There may be some slight contextual ways that they change. But essentially, they are some of the fundamentals whether we look at education 50 years in the past or 50 years into the future. But our practices are different. Our practices should be much different than 50 years ago. They should even be different than 5 years ago. They may be different tomorrow, based on our students' needs. 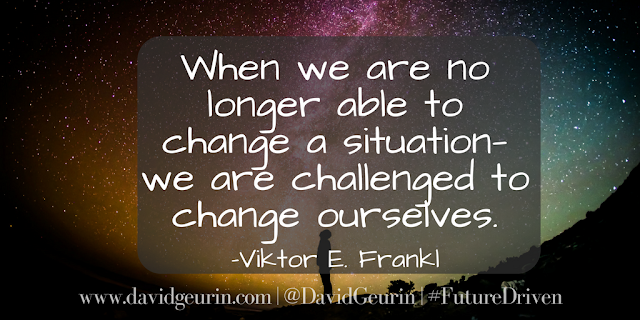 We must adapt our practices to the needs of the students we are working with today, right now. We need to adapt to the changes that are happening in the world right now as well. Teaching practices are only effective in certain situations and change over time: grading, curriculum, technology, strategies, and lessons all must change to stay relevant. Be firm in your principles. They are your core beliefs. Be flexible in your practices. They flow from your principles and are your actions today. Be firm in your mission. It's your purpose as an educator. Be flexible in your methods. Your methods are how you achieve your purpose and may change with the situation. How are you developing your principles and practices as an educator? Both are important. Leave a comment below or respond on Facebook or Twitter. Every teenager is motivated. Every student is motivated. Every teacher. Every parent. Every person is 100% motivated. That's right. You're 100% motivated to do exactly what you're doing at any given moment. I've been reading The Game Changer: How to Use the Science of Motivation With the Power of Game Design to Shift Behaviour, Shape Culture and Make Clever Happen by Jason Fox. Besides having a spectacularly long title, the book is long on great ideas too. The author makes a strong case for ways game design can be applied to bring motivation to life and work. The book shows how we are motivated to do what we are currently doing in a given moment. That's why it's not helpful to assume someone just isn't a motivated person. Whatever we are doing is what we are motivated to do. As a result, it doesn't make sense to try to change motivation. It might be possible, but it's very difficult. We will default to activities that provide the richest sense of progress. Motivation isn't the problem. The problem is the work itself. We want work that is satisfying. We meaning WE, all of us. The adults in the school want meaningful work, and so do the students. All of us. That doesn't mean that every moment of the work will be satisfying, but overall, we see progress and benefits from the work we are doing. I'm guessing none of us would do anything we are currently doing if we didn't see it as valuable or necessary to some relevant and beneficial purpose. And if we were required to do something out of compliance, that we did not value or find satisfying, over time it would be soul crushing and mind numbing. I wonder if some of our students feel that way? If all of this is true, does it really make sense to expect students to change their motivation toward learning in your classroom or school? We plead with them to do their homework. We try to convince them why the work we offer them is so important to their future. We fuss at them to do more. We try to get them to buy-in to the game of school. But why don't we just change the game? Why don't we reduce the friction? That's the point I was trying to make in a previous post, 9 Ways to Make Learning Irresistible. I'm not saying we should make things easier, just more meaningful. Gamers fail as much as 80% of the time. Kids are extremely persistent when playing the games they love. They will persist in spite of frustration. They enjoy the challenge. They will stay with the struggle. 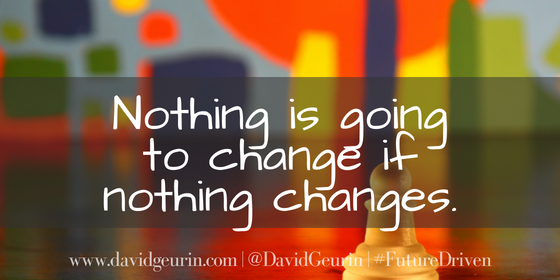 If kids aren't persisting in our lessons, maybe we need to change the game. Every game includes goals, rules, and feedback. Every classroom includes goals, rules, and feedback. If we have an effective learning design, students WILL be motivated and you WILL successfully influence their behavior. Instead of expecting students to adjust to your game, why not develop the game with their motivations in mind? Why not change the learning to meet the students where they are? To me, that's true relevance. The students in your class who are struggling have probably always struggled in school. That becomes a pattern of frustration and failure. What are you doing to disrupt that pattern? What are you doing to be a game changer? I'm really curious to know your thoughts on all of this. Leave me a comment below or respond on Facebook or Twitter. As the school year winds down, what is your school doing to recognize students? It's really common at this time of year to have awards programs to celebrate students for success and achievement. A problem with these types of programs is they tend to only recognize a certain kind of student. Praising compliance, outstanding grades, and high achievement may be motivating for some, but may also lead to disengagement, resentment, and alienation for others. What kind of success are we celebrating? I don't want to send the message to our students that only a certain type of success or achievement is celebrated in our school. All of our students are valuable and make contributions in a variety of ways. And most importantly, I want to celebrate the process of growth and learning, and not just the outcomes. Students can't always control the end result, but they can control the controllables, things like effort, enthusiasm, empathy, energy, and work ethic. It's also important to recognize students for curiosity, creativity, and perseverance. So we do our "awards" program differently. Each teacher chooses one student to recognize at our end of school assembly. But the teacher selects the student based on whatever criteria they choose. It could be for effort, improvement, citizenship, school spirit, or just showing up well and having positive energy. Some of the students who receive the award are the typical academic high flyers, but many are not. Many have probably never had their name called out in front of their peers, or their parents, to receive an award. Each teacher says just a few words about why the student was selected. These stories are powerful for showing how we value students for more than just the grades they earn. For some of our students, receiving an honor and affirmation like this could be pivotal. It could give them the spark of confidence and belief they needed at just the right time. It could inspire them to take on new challenges and set their sights higher. By the time students arrive in high school, far too many believe the system of school won't work for them. They are checked out. And no wonder. They've seen a certain type of student celebrated. They've built their identity around not being like those students, because they can't measure up to those kids anyway, the ones who get all the awards. Personal growth isn't even on their radar, and they don't see that as the purpose of school anyway. To them, school expects quiet compliance, right answers, and perfect grades. That's how you measure up. Recognizing progress and growth levels the playing field for all students. 2. Reinforce healthy attitudes about success. It's not healthy to get your sense of value or self-worth from achievements. For some, success is like a drug. They need more and more of it to get the same feeling. No matter how successful they are, in the end, it's never enough. They are dependent on success to feel good about themselves, to feel secure. Any mistake or failure is almost unbearable. They feel threatened when others do well. Some of the most high performing students in your school may not be well-adjusted in this sense. It's great to pursue excellence. But excellence is in the process of doing your very best, growing your strengths, and finding your purpose. A key finding of growth mindset was the recognition that praising effort was much more effective in motivating learning behaviors than praising fixed characteristics. The belief that I can grow my intelligence leads to better outcomes in the end. But the focus is on the process of growth, not the outcome. When we only recognize students for their achievements, we reinforce the fixed mindset. But when we recognize growth, we encourage all students to stretch themselves and strive to take on challenges. Success isn't as important as progress in this system. And failure is only a temporary setback that provides an opportunity to learn and grow. How is your school recognizing and celebrating students? 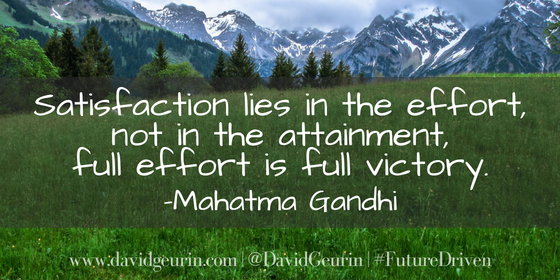 Are you encouraging effort and growth over achievement and outcomes? I want to hear from you. Leave a comment below or respond on Facebook or Twitter.